In lieu of sparkly decorations, I'm pulling out all my silver to give some shine to the season. It helps that I only just now unboxed it all! Everything I have came from yard sales and thrift stores. 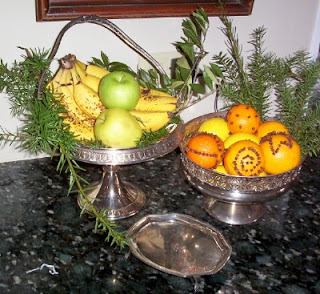 Unlike most Christmas decor, secondhand silver is often a great investment, and one that can be used year round. I read your blog shortly before heading out for a doctor's appointment and a decadent day of thrifting. And I found silver-plated coasters. 15 of them. ($7.50). Also a silver-plated candle holder ($2.50). Sadly, nothing sterling, but we'll have them add sparkle and shine.